What to Look for During the Inspection. Performing A Vehicle Inspection . Vehicle Inspection Study Guide Tractor Trailer. 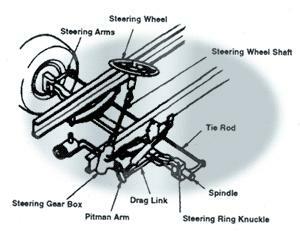 Steering to Avoid a Crash. The CDL Handbook for all 50 states uses a multiple choice CDL test question format. This means you will be given a question followed by several possible answers. Usually there will be three choices. You are to choose one answer per test question. Some states will have additional state laws that pertain to their particular state. Check with your state to see if this applies. If so, you must obtain a copy of the State CDL Handbook from the nearest DMV office and study this material until you are familiar with it. Getting Your CDL at the DMV. When you apply for your CDL, you must show proof of your identity, social security number and residency. You must provide your most recent medical examiner's certificate. You are required to hold a CDL instruction permit a minimum of 30 days or show successful completion of a DMV or Department of Education approved CDL driver education course. If you already have a driver's license, you can use it as proof of your identity, social security number and residency. 1.2 proof of identity documents, such as a driver's license, birth certificate, government issued photo identification card, CDL instruction permit, unexpired U.S. military identification card or U.S. military discharge papers. You must provide original or duplicate documents. Photocopies will not be accepted. 2.1 proof of your social security number, such as your social security card, IRS W-2 form, payroll check or check stub, unexpired U.S. Military identification card or income tax return from a previous year. Photocopies will not be accepted. If you do not want your social security number to be displayed on your license, DMV will issue a control number for your use. 3.1 proof of residency, such as a payroll check or check stub, voter registration card, IRS W-2 form, U.S. or state income tax return. Residency documents must show your name and the address of your principal residence in as it appears on your application for license. If you must meet the federal or State Motor Carrier Safety Regulations, you must provide your most recent medical examiner's certificate. Medical forms are available at any DMV office. All drivers must certify that they are in compliance with the federal or State motor carrier safety regulations or that they do not have to comply with them. Refer to the Code of Federal Regulations for an explanation of these safety requirements. To operate commercial motor vehicles, you must have: 20/40 or better vision in each eye, and 140 degrees or better horizontal vision. These visual requirements must be met without the aid of a telescopic lens. Some drivers may be granted waivers from these vision requirements. For information concerning waivers for travel intra- state, contact your local DMV. For information concerning waivers for travel inter-state, contact the Federal Motor Carrier Safety Administration at Vision Program, 400 7th Street, S.W., Washington, DC 20590.
Who Are CDL Commercial Drivers? • vehicles operated by persons only for personal use, such as recreational vehicles and rental moving vans. It's illegal for commercial drivers to have more than one license. You must keep the license issued by the state where you live. All other licenses must be returned to the states that issued them. If you fail to return licenses from other states, you could be fined up to $5,000, put in jail for up to 90 days, or both. If you want to learn to drive commercial motor vehicles, you must get a commercial driver's license instruction permit. To obtain a CDL instruction permit, you must pass the CDL general knowledge exam and the other knowledge exams for the vehicles that you want to drive. For example, if you want to learn to operate a tank vehicle and a passenger bus, you must take the general knowledge exam, the tank vehicle exam and the passenger vehicle exam. If you want to learn to drive a school bus, you must take the general knowledge, school bus and passenger vehicle exams. The CDL instruction permit allows you to drive a commercial vehicle of the class and type shown on the permit • nly when a person licensed to drive the same type of vehicle is with you. You must hold the CDL instruction permit a minimum of 30 days or show successful completion of C.D.T.S. If you hold a class A license and you have the correct endorsements, you may also operate vehicles listed in classes B and C.
Class B Any single vehicle with a GVWR of 26,001 pounds or more. If you hold a class B license and you have the correct endorsements, you may also operate vehicles listed in class C.
Class C Any vehicle that is not included in classes A or B that carries hazardous materials or is designed to carry 16 or more passengers, including the driver. Remember, the class of a vehicle is determined by its gross vehicle weight rating and the manufacturer's design. The vehicle's class determines the type of CDL and endorsements that you need. If you drive a redesigned or altered vehicle, the vehicle's original class determines the type of CDL and endorsements that you need. The type of CDL that you need is not determined by the class that the redesigned vehicle falls within. H - Permits you to drive a vehicle that transports hazardous materials. N Permits you to drive a tank vehicle. P - Permits you to drive a passenger-carrying vehicle. S - Permits you to drive a school bus. T - Permits you to drive a double or triple trailer. J - You may only operate a school/activity bus. You may not operate any other type of commercial motor vehicle. This restriction applies only if you do not pay your CDL fees. K - You may not operate a vehicle with air brakes. If you plan to operate a vehicle with air brakes, you must take the air brakes knowledge exam. You must also take the road test in a vehicle equipped with air brakes. Y - You must wear corrective lenses when operating a commercial motor vehicle. If you receive two or more moving violations within the average 5- year life of your CDL license (driving either a private or commercial vehicle) you must retake all written exams applicable to your CDL license. All commercial vehicle drivers (class A, B and C vehicles) must take the general knowledge exam. Check the following chart to find out which exams you need to take in addition to the general knowledge exam. You may take the CDL knowledge exam(s) only once per business day. If you fail any knowledge exam, you must pay a $2 re-examination fee if you retake the exam within 15 days. The two-part knowledge exam determines your knowledge of road signs and your familiarity with safe driving techniques for commercial vehicles. Test questions are taken from the information in this manual. To pass the exam, you must answer all road sign questions correctly. Make sure that you pick up a copy of the road sign booklet for your state and memorize them. You must answer at least 80% of the general knowledge questions correctly. To prepare for the knowledge exam, study all the information in this manual. When taking the two-part knowledge exam select the one best answer. Remember, your first answer is usually correct. You must take the skills exams in the type of vehicle for which you want to be licensed. If you are convicted of any of the following violations when driving a commercial motor vehicle, you will be disqualified or prohibited from driving commercial motor vehicles. • Driving a commercial motor vehicle with a blood alcohol content (BAC) of 0.04 or higher. • Failing to stop at the scene of a crash that involves your commercial motor vehicle if the crash causes injury or death. • Using a commercial motor vehicle to commit a felony. • Making a false statement on any application for a commercial driver's license. • You will receive a three-year disqualification if you were convicted of one of the offenses listed above while transporting hazardous materials. • if you are convicted of using a commercial motor vehicle in the manufacture or illegal distribution of drugs. • You will receive a 60-day disqualification if you are convicted of two serious violations within a three-year period. • You will receive a 120-day disqualification if you are convicted of three or more serious violations within a three-year period. • You will receive a 180-day disqualification for your first conviction of violating of an • ut-of-service order. • You will receive a three-year disqualification for the second and following convictions of violating • ut-of-service orders. • You may not operate commercial motor vehicles if you are convicted of driving under the influence even if you are issued a restricted license that allows you to drive during the suspension period. This applies even if the violation occurred in your personal car. CDL will be disqualified. The disqualification period ranges from 60 days to life, but does not necessarily affect your privilege to drive a passenger vehicle. Safety is the most important reason to inspect your vehicle. Inspecting your vehicle for defects can prevent breakdowns and crashes. Federal and state laws require drivers to inspect their vehicles before every trip. Federal and state inspectors can inspect your vehicle. If they find that it is unsafe, they can put it out of service until you have it fixed. If you are convicted of violating an • ut-of-service order, your CDL may be suspended or revoked. A pre-trip inspection helps you find problems that could cause a breakdown or crash. It's a good idea to inspect your vehicle within the first 25 miles of the trip and also every 150 miles or every 3 hours (whichever comes first). Inspect your vehicle at the end of the trip, day, or tour of duty. If you find any problems, report them to your employer. Additionally, whether or not you find problems, you must complete a written report and sign it. • Check for proper tire pressure using an air pressure gauge or mallet. • It is illegal to use regrooved, recapped or retreaded tires on the front wheels of a bus. 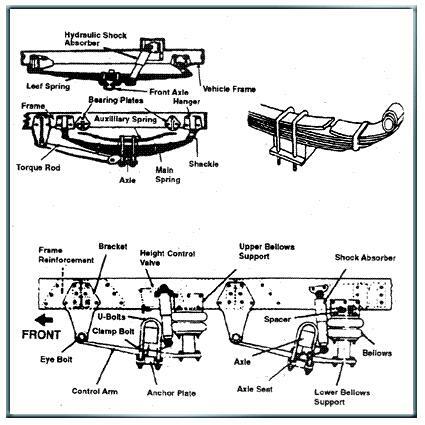 • Missing or broken leaves in any leaf spring. If one fourth or more are missing, your vehicle could be put out of service. But, any defect is dangerous. • Leaves that have shifted and could hit a tire or other part. • Make sure your truck is not overloaded. Be sure that the cargo is balanced and secured before each trip. • If you are carrying hazardous materials, be sure you have the proper papers and placarding. Before you inspect the vehicle, make sure that the parking brakes are on the wheels are chocked. If you have to tilt the cab, secure loose items so they won't fall. 1.Review the last vehicle inspection report. Drivers may have to make a vehicle inspection report each day. The motor carrier must repair any items that affect safety. The motor carrier must certify on the report that the repairs were made or that they were unnecessary. • Check the controls for looseness, sticking, damage or improper setting. • Check the mirrors and windshield. Look for cracks, dirt, illegal stickers or other obstructions. 4.Turn off the engine and check the lights and 4-way flashers. 5. Make a walk-around inspection. - Check that all curbside cargo compartment doors are securely closed, latched or locked and that required security seals are in place. 7. Start the engine and check the brake system. - If the vehicle has hydraulic brakes, pump the brake pedal 3 times. - Apply firm pressure to the pedal and hold for 5 seconds. - The pedal should not move. - If it does, there may be a leak or other problem. Get it fixed before driving. - If the vehicle has air brakes, build air pressure to 100-120 psi. Turn off the engine, release all brakes. - Press hard on the foot brake and hold down for one minute. - On combination vehicles, air pressure should not drop over 4 psi. - On single vehicles, air pressure should not drop over 3 psi. - With the foot brake, pump the air pressure down. At about 60 psi, the low air buzzer should sound. On older vehicles, a wig-wam arm will fall in view of the driver. - Keep pumping air down with foot brake. 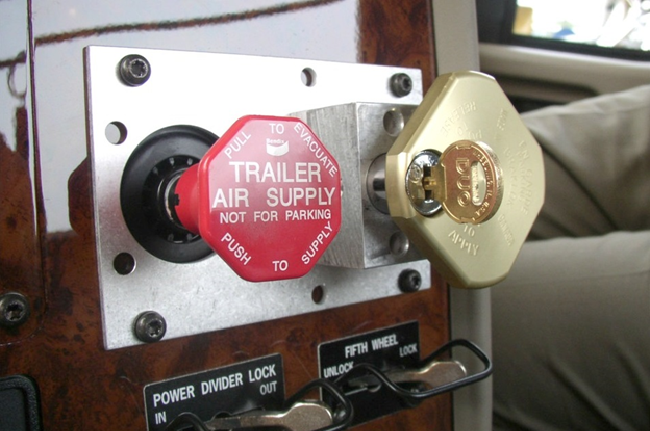 At about 40 psi, the tractor parking brake knob and the trailer parking brake knob should pop out. If you find anything wrong with the brake system, get it fixed before you drive. - Set the parking brake. - Put the vehicle in low gear and gently release the clutch until you feel the tractor pulling against the brake. - The vehicle should not move. • all parts of the coupling system (5th wheel lower plate, etc.) You will not be able to see the lower plate if the vehicle is hooked up. • Remember, semi-trailers cannot exceed a length of 53 feet. If you find anything unsafe during the pre-trip inspection, get it fixed before you drive. It's against federal and state laws to operate an unsafe vehicle. Buckle up on every trip. It's the law. During the actual test you will be expected to point to each of the parts of your vehicles listed below. Name the part and explain what damage or problems you might find with it. The types of damage or problems are listed below in the vehicle inspection section of this manual. Begin the inspection at area 1 on the curb (right) side of the vehicle. Follow the numeric order provided below to the rear of the vehicle, ending with area 18. During the actual test you will be expected to point to each of the parts of your vehicles listed below. Name the part and explain what damage or problems you might find with it. The types of damage or problems are listed below in the vehicle inspection section of this manual. Begin the inspection at area 1 on the curb (right) side of the vehicle. Follow the numeric order provided below to the rear of the vehicle, ending with area 13. During the actual test you will be expected to point to each of the parts of your vehicles listed below. Name the part and explain what damage or problems you might find with it. The types of damage or problems are listed below in the vehicle inspection section of this manual. Begin the inspection at area 1 on the curb (right) side of the vehicle. Follow the numeric order provided below to the rear of the vehicle, ending with area 15. Be sure to apply the parking brake when you leave your vehicle. • Partly engage the clutch before taking your foot off the brake. • Use the parking brake to keep from rolling back. Release it only when you have enough power to keep from rolling back. • Speed up smoothly and gradually so the vehicle does not jerk. Sudden acceleration can cause mechanical damage. If you are pulling a trailer, sudden acceleration can damage the coupling. • Speed up slowly when traction is poor, such as in rain or snow. If you use too much power, the drive wheels spin. If the drive wheel spins, let up on the accelerator. • Hold the steering wheel firmly with both hands. • Your hands should be at the 9 o'clock and 3 o'clock position on the steering wheel. • Look at your path before you begin backing. Get out of the vehicle and check your clearance to the sides and overhead. • Turn on four-way flashers and blow the horn before backing. • Back slowly. Use the lowest reverse gear. • Back and turn toward the driver's side. This allows you to see better. You can watch the rear of your vehicle by looking out the side window. Use driver-side backing even if it means going around the block to put your vehicle in this position. The extra safety is worth it. • Use a helper. A helper can check your blind spots for you. The helper should stand where he or she has a view of the rear of the truck and where the driver can see the helper. If you lose sight of the helper, stop. He may be in a place of danger. Before you begin backing, agree on hand signals that you both understand. • When backing a car, straight truck or bus, you turn the top of the steering wheel in the direction that you want to go. When backing a trailer, turn the steering wheel in the opposite direction. Once the trailer starts to turn, you must turn the wheel the other way to follow the trailer. • When you back a trailer, try to position your vehicle so you can back in a straight line. If you must back on a curved path, back to the driver's side so you can see. • Use both mirrors. The mirrors help you see if the trailer is staying on the proper path. Correct the trailer's path by turning the top of the steering wheel in the direction of the drift. • Pull forward. Make pull-ups to reposition your vehicle as needed. • Release the accelerator. Push in the clutch and shift to neutral. • Push in the clutch and shift to the higher gear. • Release the clutch and press the accelerator at the same time. Shifting gears using double clutching requires practice. If you remain too long in neutral, you may have trouble putting the vehicle into the next gear. Don't try to force it. Return to neutral, release the clutch, increase engine speed to match road speed and try again. • Engine speed (RPM). Study the manual for your vehicle and learn the operating RPM range. Watch your tachometer and shift up when your engine reaches the top of the range. • Road speed (MPH). Learn the speeds that each gear is good for. Then you can use the speedometer to know when to shift up. • Downshifting requires knowing when to shift. Use either the tachometer or the speedometer to decide when to downshift. • Take your foot off the accelerator. Push in the clutch and shift to neutral. • Press the accelerator. Increase engine and gear speed to the RPM required in the lower gear. • Push in the clutch and shift to the lower gear at the same time. • Before starting down a hill. Slow down and shift down to a speed that you can control without using the brakes hard. Make sure your gear is low enough. Usually you will use a lower gear than you would use to climb the same hill. • Before entering a curve. Slow down to a safe speed. Downshift before you enter the curve. This helps you control your vehicle while turning. You can begin to accelerate as you leave the curve. Retarders help slow a vehicle so that you don't need to use your brakes as much. This reduces brake wear and gives you another way to slow your vehicle. All retarders can be turned on or off by the driver. When turned on, retarders apply their braking power whenever you take your foot completely off the accelerator. They apply braking power only to the drive wheels. To be a safe driver, you need to know what's going on all around your vehicle. Because stopping or changing lanes may take a lot of distance, you must know what the traffic is doing on all sides of you. Expert drivers look far ahead so they will know how much room they have to move. They try to focus their eyes 12 to 15 seconds ahead. In the city, this equals approximately one block. On the highway, this equals approximately ¼ of a mile. When you scan ahead, check for traffic, road conditions, sharp pavement drop-offs and signs. Also look for slow-moving vehicles. These vehicles may be marked with a red triangle with an orange center. Be especially careful when driving through work zones. Looking ahead doesn't mean that you aren't paying attention to other things going on around you. Good drivers shift their attention back and forth, near and far. Remember you're the expert. Anticipate trouble and leave yourself a place to go if a hazard appears suddenly. A hazard is anyone or anything that can cause an unsafe condition. The best drivers are defensive and prepared for hazards. Look in your mirrors to check the traffic around you and to check your vehicle. Check your mirrors when you change lanes, turn or merge. Check your mirrors quickly and return your attention to the road ahead. Use your mirrors to check your tires. If you are carrying open cargo, use the mirrors to check it. Look for loose straps, ropes or chains. Watch for a flapping or ballooning tarp. Blind spots are danger areas, which cannot be seen in your mirrors. Therefore, many vehicles have curved mirrors that show a wider area than flat mirrors. Remember, everything in a curved mirror appears smaller than it really is. Objects also seem farther away than they really are. Always make mirror adjustments before you start your trip. Mirrors can only be checked accurately when the trailer(s) are straight. It is important to know what is going on around your vehicle. But, it is also important to let others know what you are doing. Use your vehicle to communicate with other drivers. You can communicate with your headlights, brake lights, signal lights and horn. • Signal before you turn, merge or change lanes. • Brake early and slow gradually for turns. • Flash your brake lights to warn other drivers that you need to slow down or stop. Don't stop suddenly. • Turn off your signal after you make the turn, merge or lane change. • Use your 4-way emergency flashers when moving slowly or when you are parked. • Don't signal other drivers to pass you. This could cause a crash. • Check your side mirrors for traffic approaching you from behind. • Check ahead. Do you have sufficient room to pass? • Use your turn signal. • Just before you begin passing, check your mirrors and blind spots once more for approaching traffic. • Don't assume that other drivers, bicyclists, or pedestrians can see or hear your vehicle. • Use your low beam headlights at dawn and dusk. Use your low beam headlights in fog, rain or snow so other drivers will see you. • When you pass, tap your horn lightly. • Use your horn only when needed. Otherwise, your horn may scare others. • Turn on your 4-way emergency flashers. • Place reflective triangles or flares within 10 minutes of stopping. Place them as shown in the diagrams. If you stop on a road or the shoulder or any road, you must put out emergency warning devices (reflective triangles or flares) within 10 minutes. Place the warning devices in the following locations. Place warning devices within ten feet of the front or rear corners of your vehicle. Place a warning device 100 feet behind or ahead of your vehicle. Place it on the shoulder or in the lane where you stopped. Place a warning device before any hill, curve or anything else that prevents other drivers from seeing your vehicle with 500 feet. Place warning devices 10 feet, 100 feet and 200 feet behind your vehicle. When you place the triangles, hold them between yourself and the oncoming traffic. This helps ensure your safety. To be a safe driver, you need space all around your vehicle. When something goes wrong, space gives you time to think and to take action. While this is true for all vehicles, it is very important for large vehicles. Large vehicles require more space for stopping and turning. You need space in front of you in case you must stop suddenly. In crashes, trucks and buses most often hit the vehicle in front of them. This is because they were following too closely. If the vehicle ahead of you is smaller than your vehicle, it can probably stop faster than you can. If you follow too closely, you could hit it if the driver stops suddenly. • If you are driving below 40 mph, maintain at least one second for each 10 feet of vehicle length. • At speeds over 40 mph, add an extra second for safety. 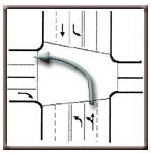 • Watch the vehicle ahead pass a fixed point, such as an overpass, sign, fence, corner or other marker. • Begin counting off the seconds it takes you to reach the same place in the road. • If you reach the mark before you have counted off the correct number of seconds, you're following too closely. Slow down and increase your following distance. • If you are driving a 40-foot vehicle at speeds under 40 mph, leave 4 seconds between you and the vehicle ahead. One second for each 10 feet of vehicle length = 1X4 or 4 seconds. each 10 feet of vehicle length plus an additional second for safety: 1X4 = 4 plus an extra second for safety = 5 seconds. • If you are driving a 60-foot vehicle at speeds under 40 mph, leave 6 seconds between you and the vehicle ahead. One second for each 10 feet of the vehicle length = 1X6 or 6 seconds. • If you are driving a 60-foot vehicle at speeds over 40 mph, leave 7 seconds between you and the vehicle ahead. One second for each 10 feet of vehicle length plus an additional second for safety: 1X6 = 6 plus an extra second for safety = 7 seconds. Remember, the rule of seconds applies only in good weather and depends on the condition of your vehicle and the road: In bad weather, heavy traffic, poor pavement or if your vehicle is in poor condition, add extra seconds to your following distance. You can't keep other drivers from following you too closely. But you can take action to increase your safety. • Stay to the right. Drivers often tailgate when heavy vehicles can't keep up with traffic. If a heavy load slows you down, stay in the right lane. If you are going uphill, do not pass other slow vehicles unless you can pass quickly and safely. • Deal with tailgaters safely. • Avoid quick changes. Before you slow down or turn, signal early and reduce your speed gradually. • Increase your following distance. Extra space in front of your vehicle can help you avoid sudden stops. It also makes it easier for the tailgater to pass you. • Don't speed up. It's safer to be tailgated at a low speed than at a high speed. • Avoid tricks. Don't turn on your tail lights or flash your brake lights. Keep your vehicle centered in the lane and maintain safe clearance on either side. • Avoid traveling beside other vehicles. In heavy traffic, keep as much space as possible between your vehicle and other vehicles. If you must travel alongside another vehicle, drop back or pull forward so that you are sure the other driver can see you. • High winds may cause your vehicle to sway. This problem is worse for lighter vehicles, such as empty trucks. High winds may be especially bad coming out of tunnels. Because commercial vehicles are larger than most vehicles, watch out for overhead objects. Make sure you always have overhead clearance. • Before backing, get out of the vehicle and check for overhanging objects such as trees, branches or electric wires. It's easy to miss these things when backing. • Don't assume that the heights posted at bridges and overpasses are correct. Repaving or packed snow may have reduced the clearance since the signed were posted. • If you are not sure that you have space to pass under an object, go slowly; or take another route. Definition: Trailer wheels follow a different path than the tractor wheels. This is called off-tracking. Because of wide turning and off-tracking, large vehicles can hit other vehicles or objects during turns. • Turn slowly to give yourself and others time to avoid problems. • If you cannot make the right turn without swinging into another lane, turn wide as you complete the turn. Refer to the diagram. Keep the rear of your vehicle close to the curb. This will stop other drivers from passing you on the right. • Don't turn to the left as you start the turn. The driver behind you may think you are turning left and try to pass you on the right. • If you must cross into an oncoming lane to make a turn, watch out for vehicles coming toward you. Give them room to pass or stop. However, don't back up for them. You could hit the vehicle behind you. • Reach the center of the intersection before you begin your turn. If you turn too soon, your vehicle could hit another vehicle because of offtracking. • If there are two lanes, always use the right turn lane. 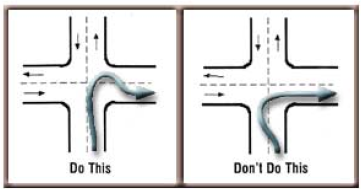 Don't begin a left turn in the left lane because you may have to swing right to complete the turn. You can see drivers on your left easier than those on your right. Keep these points in mind when crossing or entering traffic. • Because commercial vehicles are larger and accelerate more slowly than passenger cars, you may need a much larger gap to enter traffic. • Acceleration varies with your load. Allow more room if your vehicle is fully loaded. Before you begin across a road, make sure you can get all the way across before traffic reaches you. Driving too fast is a major cause of crashes and fatalities. You must adjust your speed to suit weather conditions, the road (such as hills and curves), visibility and traffic. • Perception distance is the distance your vehicle travels from the time your eyes see a hazard until your brain recognizes it. Perception time for an alert driver is about ¾ second. At 55 mph, you travel 60 feet in ¾ second. • Reaction distance is the distance traveled from the time your brain tells your foot to move from the accelerator until the time your foot pushes the brake pedal. An average driver reacts within ¾ second. This adds an additional 60 feet to the distance traveled. • Braking distance is the distance it takes the vehicle to stop once you hit the brakes. At 55 mph on dry pavement, it takes a vehicle with good brakes about 4 ½ seconds to stop. Within that time, the vehicle will travel another 170 feet. • Total stopping distance; traveling at 55 mph, it will take about 6 seconds to stop your vehicle. The vehicle will travel approximately 290 feet before coming to a stop. That's approximately the length of a football field. • When you double your speed, it takes four times as much distance to stop your vehicle. • Your vehicle will have four times the destructive power in a crash. • You can't steer or brake a vehicle unless you have traction. Traction is the friction between the tires and the road. Reduce your speed on wet and slippery roads. • Wet roads can double stopping distance. Reduce your speed by about 1/3 on a wet road. For example slow down from 55 mph to 35 mph. • On packed snow, reduce your speed by ½ or more. • If the road is icy, reduce your speed to a crawl. Stop driving as soon as you can. • Empty trucks require greater stopping distance. An empty vehicle has less traction. The brakes are designed to control the maximum weight of the unit; therefore, the brakes lock up more readily when the trailer is empty or lightly loaded. This can cause skidding and loss of control. • Shady parts of a road will remain icy and slippery long after open areas have melted. • Bridges freeze before the road freezes. Be careful when the temperature is around 32 degrees F.
• Slight melting makes ice wet. Wet ice is more slippery than ice that is not wet. • Black ice is a thin layer that is clear enough that you can see the road underneath. It makes the road look wet. When the temperature is below freezing and the road looks wet, watch for black ice. • If ice is on the front of your mirror, mirror support or antenna, the road surface is probably starting to ice up. • Roads are very slippery when rain first begins. Just after rain begins, water mixes with oil on the road making it unusually slippery. Hydroplaning - In some weather, water or slush collects on the road. When this happens, your vehicle can hydroplane. The tires lose contact with the road and have little or no traction. You may not be able to steer or brake. Hydroplaning can occur at speeds as low as 30 mph. Hydroplaning is more likely if tire pressure is low or the tread is worn. • Take your foot off the accelerator and push in the clutch. • This will slow your vehicle and let the wheels turn freely. • Do not use the brakes to slow down. • If the drive wheels begin to skid, push the clutch to let them turn freely. If you take a curve too fast, your tires can lose traction with the road. This could cause your vehicle to skid off the road or roll over. Tests show that trucks with a high center of gravity can roll over at the posted speed limit for a curve. • Slow to a safe speed before you enter a curve. • Braking in a curve is dangerous because you can lock the wheels and cause a skid. • Never exceed the posted speed limit for a curve. • Downshift to a gear that will let you accelerate slightly in the curve. This will help you keep control. • You should always be able to stop within the distance you can see ahead. • Fog, rain or other conditions may require you to slow down. • At night, you can't see as far with low beams as you can with high beams. When you use low beams, slow down. • As you go downhill, your vehicle's speed increases. • Never exceed the maximum safe speed on a downgrade. • Downshift to a low gear before staring down a grade. • You must use the braking effect of the engine to control your speed on downgrades. The engine's braking effect is greatest when it is near the governed RPMs and the transmission is in a low gear. • Save your brakes so that you can slow or stop as required by road and traffic conditions. 1.A School bus may travel 45 mph when not loading or unloading passengers between its starting point and its destination. However, during the loading and unloading of students-from the first pick-up/drop- off to the last pick-up/drop-off-the maximum speed is 35 mph. A School bus may travel 55 mph on an interstate either loaded or unloaded. 2.Speed limit is 45 mph on secondary roads which include all public roads and streets providing principally local services not designated as part of the interstate or primary system. This excludes those roads maintained by several counties and incorporated towns and cities with populations over 3,500. Emergency braking does not mean pushing down on the brake pedal as hard as you can. That will lock the wheels and cause a skid. Instead, brake so that you keep your vehicle in a straight line. You can use the controlled braking method or the stab braking method. • Apply the brakes as hard as you can without locking the wheels. • Steer as little as possible. • If you need to steer harder or if the wheels lock, release the brakes. • Reapply the brakes as soon as possible. • Use stab braking only on vehicles that do not have anti-lock brake systems. • Apply your brakes fully. • Release the brakes when the wheels lock up. • As soon as the wheels start rolling, apply the brakes fully again. It can take up to one second for the wheels to start rolling after you release the brakes. If you reapply the brakes before the wheels start rolling, the vehicle will not straighten out. Definition: Counter-steer means to turn your wheel in the opposite direction. Emergency steering and counter-steering are two parts of one driving action. • Stopping is not always the safest thing to do in an emergency. If you don't have enough room to stop, you may have to steer away from what's ahead. Many times you can turn to miss an obstacle more quickly than you can stop. Often, steering to the right is the best answer in an emergency situation. However, top-heavy vehicles and tractors with multiply trailers may roll over. When steering to avoid a crash, take the following steps. • Keep both hands on the steering wheel. • Do not apply the brakes while you are turning. Applying the brakes could lock your wheels and cause you to skid out of control. • Do not turn more than you need. The more sharply you turn, the greater the risk of turning over or skidding. • Be ready to counter-steer as soon as you have passed whatever was in your path. In some emergencies, you may have to drive off the road. Most shoulders are strong enough to support the weight of a large vehicle and offer an escape route. Follow these steps if you must drive off the road. • Avoid braking until your speed has dropped to about 20 mph. Then brake gently to avoid skidding. • Keep one set of wheels on the pavement if possible. This helps you to maintain control. • Stay on the shoulder until your vehicle comes to a stop. Signal and check your mirrors before returning to the road. • If you must return to the road before you stop, hold the wheel tightly and turn sharply enough to get back on the road safely. Don't try to edge on to the road gradually. This could cause you to lose control. As soon as both front tires are on the paved surface, counter-steer immediately. • Over-braking. Braking too hard can lock the wheels causing a skid. Skids may also happen if you use the speed retarder when the road is slippery. • Oversteering Or turning the wheels too sharply may cause a skid. • Over-acceleration Or supplying too much power to the drive wheels can cause them to spin. • Driving too fast. Most serious skids result from driving too fast for road conditions. Drivers who adjust their driving to fit the conditions don't have to over-accelerate, brake hard or over-steer to avoid hazards. Rear-Wheel (drive-wheel) skids are the most common types of skid. They are caused by over-acceleration or over-braking. • Over-acceleration skids usually happen on ice or snow. Stop the skid by taking your foot off the accelerator. If the road is slippery, push in the clutch. This allows the wheels to roll freely and regain traction. • Over-braking skids happen when the rear drive wheels lock. Locked wheels have less traction than rolling wheels and usually slide sideways. A bus or straight truck will slide sideways. A vehicle towing a trailer will jackknife. Take the following actions to stop a rear-wheel braking skid. • Stop braking. This will let the rear wheels roll and keep them from sliding further. If you are on a slippery surface, push in the clutch to let the wheels turn freely. • Turn quickly. If your vehicle begins to slide sideways, quickly steer in the direction you want the vehicle to go. • Counter-steer. As soon as your vehicle begins to move in the correct direction, turn the steering wheel quickly in the opposite direction. This will prevent a skid in the opposite direction. Be careful not to over-correct. Front wheel skids are often caused by driving too fast for the conditions. In a front wheel skid, the front of the vehicle continues in a straight line no matter how much you turn the steering wheel. You may not be able to steer around a curve or turn. Lack of tread on the front tires and cargo loaded incorrectly may also cause front-wheel skids. • The only way to stop a front-wheel skid is to let your vehicle slow down. • Stop turning and braking as hard. • Slow down as quickly as possible without skidding. Driving becomes hazardous when visibility is reduced or when the road surface is covered with rain, snow or ice. Reduce your speed and increase your following distance. Three factors affect safe driving at night: The driver, the roadway and the vehicle. Your vision and the vision of other drivers is not as sharp in low light conditions. Drivers can also be blinded for a short time by the lights of oncoming vehicles. Older drivers are especially bothered by glare from the lights of other vehicles. • Use your high beams when it is safe and legal. 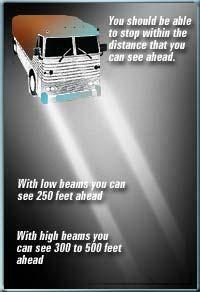 High beams increase your ability to see. However, glare from your headlights can blind other drivers. Dim your lights within 500 feet of an oncoming vehicle. Dim your light when following within 200 feet of another vehicle. If a driver coming toward you doesn't dim his lights, don't get back by turning on your high beams. This increases the chance of a crash. • Don't look directly at bright lights when driving. Look to the right of the road. Watch the side of the road when another car or truck comes toward you. It can take several seconds to recover from blindness caused by glare. Even two seconds of glare blindness can be dangerous. A vehicle going 55 mph will travel more than half the distance of a football field during that time. • Get enough sleep before you drive. Being tired and lack of alertness are problems for drivers at night. Most people are less alert at night, especially after midnight. This is even more true if you have been driving for a long time. • If you are sleepy, pull off the road and get some sleep. You cannot control your need for sleep. Drivers who are tired may not see hazards as soon or react as quickly. This increases the chance of a crash. During the day, there is usually enough light to see well. At night, some streets may have bright lights, but others will have poor lighting. On most roads, you will probably have to depend on your headlights. Less light means you will not be able to see hazards as quickly. Pedestrians, joggers, bicyclists, animals and other objects may be difficult to see. Even when there are street lights; the scene may be confusing. Traffic signals and hazards can be hard to see against a background of signs, store windows and other lights. • Drive slower when lighting is poor or confusing. Drive slowly enough so that you can stop within the distance that you can see ahead. • Watch for drunk drivers. Be extra careful when bars and restaurants are closing. Watch drivers who weave, drive too slow or too fast, or stop for no reason. At night, you must depend on your headlights to see and be seen. However, you can't see as much with your headlights at night as you can see during the day. • Adjust your speed so that you can stop within the distance that you can see ahead. With your low beams, you can see ahead about 250 feet. With your high beam, you can see ahead between 300 and 500 feet. If you are driving with your low beams on, you should be able to stop within 250 feet. If you are driving with your high beams on, you should be able to stop within 300 to 500 feet. • Make sure that your headlights are clean and adjusted properly. Dirty headlights give only half the light they should. This makes it harder for you to see and harder for other drivers to see you. If your headlights are out of adjustment, they won't give you a good view and they can blind other drivers. • Be sure that your windshield and mirrors are clean. Dirt on your windshield and mirrors can increase the glare from other vehicles' lights. This will make it hard for you to see other vehicles and hazards. • Obey all fog-related warning signs. • Turn on all your lights. • Use only your low beams. • Be prepared for sudden stops. During your pre-trip inspection, pay extra attention to the following items. Be sure that these systems are working correctly and that you know how to use them before you begin driving. • Clear your vehicle of all snow and ice. Be sure your lights, reflectors, windows and mirrors, handholds, steps and deck plates are free of snow and ice. • As a precaution, carry the right number of chains and extra cross links. Make sure they fit your drive tires. Check the chains for broken hooks, worn or broken cross links and bent or broken side chains. Learn how to put the chains on before you need to use them. • Remove ice from the radiator shutters. Make sure the winterfront is not closed too tightly. If the shutters freeze or the winterfront is closed too much, the engine may overheat. • Check the exhaust system for loose parts and for signs of leaks. Loose connections can let carbon monoxide leak into the vehicle. This can cause sleepiness. In large amounts it can kill you. • Drive smoothly and slowly on slippery roads. Don't hurry. If the roads are very slippery, don't drive at all. Stop at the first safe place. • Adjust turning and braking to road conditions. Make turns as gently as possible. Don't brake any harder than necessary. Don't use the engine brake or speed retarder on slippery or wet roads. They can cause the driving wheels to skid. • Adjust speed to conditions. Don't pass slower vehicles unless necessary. Go slow and watch far enough ahead to keep a steady speed. Avoid slowing down and speeding up. Take curves at slower speeds and don't brake while you're in the curve. Remember, as the temperature rises and the ice begins to melt, the road becomes even more slippery. • Adjust space to road conditions. Don't drive beside other vehicles. Keep extra following distance. Watch ahead for slowing or stopped traffic. Slow down gradually. • Avoid driving through deep puddles or flowing water. if you are pulling a trailer. If you must drive through water, following these steps. • Put your transmission in low gear. Engage the clutch smoothly. • Put on the brakes gently. This presses the linings against the brake drums or discs and keeps mud, silt, sand and water out of your brakes. • Increase the engine RPM and cross the water while keeping light pressure on your brakes. • As soon as you are out of the water, maintain light pressure on the brakes for a short distance. This will heat them and dry them out. Make a test stop as soon as it is safe. If, the brakes do not work well, drive for another short distance with light pressure on the brakes. Don't apply too much pressure on the brakes or you may overheat the brake drums and linings. • Make sure you have plenty of engine oil and engine coolant. Engine oil lubricates the engine and helps keep it cool. Antifreeze helps the engine under hot conditions and in cold conditions. While you are driving, check the oil temperature gauge and the engine temperature gage. If these gauges show a temperature higher than normal, stop driving as soon as safely possible. There could be something wrong that could lead to engine failure or fire. • Check engine belts and hoses. Check the belts for tightness by pressing on the belts. Be sure coolant hoses are in good condition. Loose belts or broken hoses can lead to engine failure and fire. • While you're driving, inspect the tires every two hours or every 100 miles. Air pressure increases with temperature. Do not let air out. If you let air out, the pressure will be too low when the tires cool. If a tire is too hot to touch, remain stopped until the tire cools. Otherwise, the tire may blow out or catch on fire. • Never remove the radiator cap or any part of the pressurized system until the system has cooled. Steam and boiling water can spray under pressure and cause severe burns. If you can touch the radiator cap with your bare hand, it is probably cool enough to open. You can also check the coolant level of a hot engine if a coolant container is part of a pressurized system. • Watch for bleeding tar. In hot weather, spots where tar bleeds to the road surface are very slippery. • Drive slow enough to prevent overheating. High speeds create more heat for tires and the engine. In desert conditions, the heat may rise to a dangerous level. The heat will increase the chance of tire failure, engine failure and fire. Gravity plays a major role in mountain driving. On upgrades, gravity slows you down. The steeper and longer the grade, and the heavier you load, the slower you will drive. When coming down a downgrade, gravity increases the speed of your vehicle. Try to plan ahead and get information about any steep grades along your planned route. • Never drive faster than the speed posted on "Maximum Safe Speed" signs. Remember that the speed posted on these signs could be too fast for a large vehicle or for the weather conditions. • Pay attention to warning signs that tell the length and steepness of the grade. • Use the braking effect of your engine to maintain a safe speed. The braking effect of the engine is best when the transmission is in a low gear. Save your brakes so you can slow down or stop for traffic and road conditions. • Shift the transmission to a lower gear before you start down the grade. Don't downshift after you've gained speed. You won't be able to shift into a lower gear. You may not be able to get back into any gear. For older trucks, use the same gear for going down a hill that you would use to climb the hill. New trucks have more powerful engines and can climb hills in higher gears than older trucks. Therefore in newer trucks, use a lower gear for going down a hill than you would use for climbing the hill. • Be sure your brakes are adjusted before you begin a trip through the mountains. If you use your brakes too much, they will fade. Excessive heat causes the brake drums to expand. As a result, the brake shoes have to travel further and exert less stopping force. This situation is made even worse if the brakes were not properly adjusted to begin with. Remember, the more you use your brakes, the more quickly they will get out of adjustment. • Apply the brakes just enough to feel a definite slowdown. • Reduce your speed to 5 mph below your safe speed. This should take about 3 seconds. Then, release the brakes. • When your speed has increased to your safe speed, repeat the first steps. If your safe speed on a steep grade is 40 mph, don't apply your brakes until your speed reaches 40 mph. Apply your brakes enough to reduce your speed to 35 mph. This should take about 3 seconds. Release the brakes. Repeat these steps until you reach the end of the downgrade. • Know where the escape ramps are located on your route. Escape ramps have been built on many steep downgrades. They are made to stop runaway vehicles without injuring drivers and passengers. Escape ramps use a long bed of loose soft material to slow runaway vehicles. Use them if you lose your brakes. Railroad crossings are always dangerous. Always look both ways. Trains may come at any time from either direction. Follow these rules when crossing railroad tracks. • Don't try to race a train to the crossing. It is very difficult to judge the speed of a train. • Reduce your speed. Be sure you can stop before you reach the tracks if necessary. • Because of the noise in your cab, you won't hear the train horn until the train is very close. • Don't rely on train warning signals or flagmen to let you know of an approaching train. • Double tracks require more caution. A train on one track may hide a train on the other track. • After one train has cleared the crossing, check again. Be sure that no other train is coming before you cross the tracks. • Railroad crossing with steep approaches can cause your vehicle to hang up on the tracks. This is most likely to happen to vehicles that have low ground clearance, such as drop frame trailers and car carriers. If you get hung up on a railroad crossing, notify the police immediately so that the nearby trains can be stopped. • Be sure you can get all the way across the tracks before you begin to cross. • Do not shift gears when crossing railroad tracks. • A full stop is required at railroad crossings if you are carrying passengers or hazardous cargo. You must also stop if the lights are flashing, the arms are down or you are directed to stop by signs or the police. • Downshift. Putting your vehicle in a lower gear will help slow the vehicle. • Pump the brakes. This will sometimes generate enough hydraulic pressure to stop the vehicle. • Find an escape route. While slowing your vehicle, look for an escape route-an open field, side street or escape ramp. Excessive use of the service brakes causes overheating and leads to brake fade. Excessive heat in the brakes causes chemical changes in the lining which reduce friction and cause the brake drums to expand. As the overheated drums expand, the brake shoes and linings have to move farther to contact the drums. The force of contact between the shoes and drums is also reduced. Overuse may increase brake fade until the vehicle cannot be slowed or stopped at all. Brakes that are out of adjustment may also cause brake fade. To safely control the vehicle, every brake must do its share of the work. Brakes out of adjustment stop doing their share before brakes that are in adjustment. This causes the other brakes to overheat and fade. Brakes can get out of adjustment quickly, especially when they are hot. Therefore, brake adjustment must be checked frequently. • Brake failure on downgrades. Driving slowly and braking properly will almost always prevent brake fade on long downgrades. Once the brakes fail, however, you must look outside your vehicle for something to stop it. few miles from the top of a downgrade. Signs will be posted telling you about it. Use the escape ramp if it is available. If you don't see an escape ramp, take the least hazardous escape route--an open field or a side road that flattens out or turns up hill. Look for an escape route as soon as you know that your brakes don't work. The longer you wait, the more speed your vehicle will gain and it will be harder to stop. • Sound. A loud bang often indicates a blowout. However, it may take several seconds for your vehicle to react and you might think that the sound came from another vehicle. Any time you hear a tire blow, assume that it was one of your tires. • Vibration. If your vehicle thumps or vibrates, a tire may have gone flat. With a rear tire, this may be the only sign you get. • Feel. If the steering feels heavy, one of the front tires has probably failed. Sometimes, failure of a rear tire causes the vehicle to slide back and forth or fishtail. However, dual rear tires usually prevent this. • Hold the steering wheel firmly. If a front tire fails, it can twist the steering wheel out of your hand. Keep a firm grip on the steering wheel with both hands at all times. • Stay off the brakes. Braking when a tire has failed could cause you to lose control. Unless you are about to run into something, stay off the brake until the vehicle has slowed down. Then, brake gently and pull off the road. • Check the tires. Even if the vehicle seems to be handling normally. Many times you won't know that a dual tire is flat unless you look at it. • Care for the injured. Protect the Area to prevent another crash. This is the first thing you should do. • If your vehicle is involved in the crash, try to move it to the side of the road. This will help prevent another crash. • If you are stopping to help at the scene of a crash, park away from the crash. The area around the crash will be needed by emergency vehicles. • Put on your flashers. • Set out reflective triangles to warn other traffic. Make sure that other drivers will see them in time to avoid another crash. If you have a CB or cellular telephone, put out a call over the emergency channel or dial 911 before you get out of your vehicle. If not, wait until the crash scene has been protected, then phone or send someone to phone the police. Remember to determine where you are so you can give an accurate location. If a qualified person is helping the injured, stay out of the way unless asked to assist. Otherwise, do the best you can to help anyone who is injured. • Don't move a severely injured person unless there is a danger of fire or passing traffic makes it necessary. • Stop heavy bleeding by applying direct pressure to the wound. • Keep the injured person warm. • After accidents: spilled fuel, improper use of flares. • Tire: under-inflated tires and dual tires that touch. • Electrical system: short circuits due to damaged insulation, loose connections. • Fuel: driver smoking, improper fueling, loose fuel connections. • Cargo: flammable cargo, improperly sealed or loaded cargo, poor ventilation. • Pre-trip inspection: Make a complete inspection of the electrical, fuel and exhaust systems, tires and cargo. Be sure that your fire extinguisher is charged. Be sure that you know how to use it. • Inspections while traveling: Check the tires and hubs for signs of excessive heat whenever you stop during a trip. Frequently check the instruments and gauges for signs of overheating. Use your mirrors to look for signs of smoke from the tires or other areas of the vehicle. • Safe procedures: Don't get careless. Always follow correct safety procedures for fueling the vehicle, using brakes, handling flares and other activities that can cause a fire. • Pull off the road. • Park in an open area away from buildings, trees, brush, other vehicles or anything that might catch fire. • Don't pull into a service station. • Notify the police of your problem and location. • Keep the fire from spreading before you try to put it out. • If your engine is on fire, turn off the engine as soon as you can. Open the hood as little as possible. Shoot the fire extinguisher through louvers, the radiator grille or from the underside of the vehicle. • If you have a cargo fire in a van or box trailer, keep the doors shut, especially if your cargo contains hazardous materials. Opening the doors will supply the fire with oxygen and will cause it to burn very fast. • Use the right fire extinguisher: By regulation, BC extinguishers are required on commercial vehicles, A,B, C are an acceptable alternate. • B,C type extinguishers work on electrical fires and burning liquids. Don't use water on electrical or gasoline fires. • A,B,C type extinguishers work on burning wood, paper and cloth as well as burning liquid and electrical fires. • Water can be used on wood, paper, cloth and burning tires. Don't use water on an electrical fire (you could get shocked) or on a fire involving petroleum products. • If you're not sure what to use, especially if you have a hazardous material fire, wait for qualified fire fighters. • Extinguish the fire only if you know what you are doing and it is safe to do so. • When using the extinguisher, stay as far away from the fire as possible. • Aim at the source or base of the fire, not up in the flames. • Position yourself upwind. Let the wind carry the extinguisher to the fire instead of carrying the flames to you. • Be sure you have a path of retreat if you are unable to control the fire. • Continue until whatever was burning has cooled. If you don't see any smoke or flames, don't assume that the fire is out. It could be smoldering and it could restart. All drivers should know something about hazardous materials. You must be able to recognize hazardous cargo and you must know if you can haul it without having a hazardous materials endorsement on your commercial driver's license. 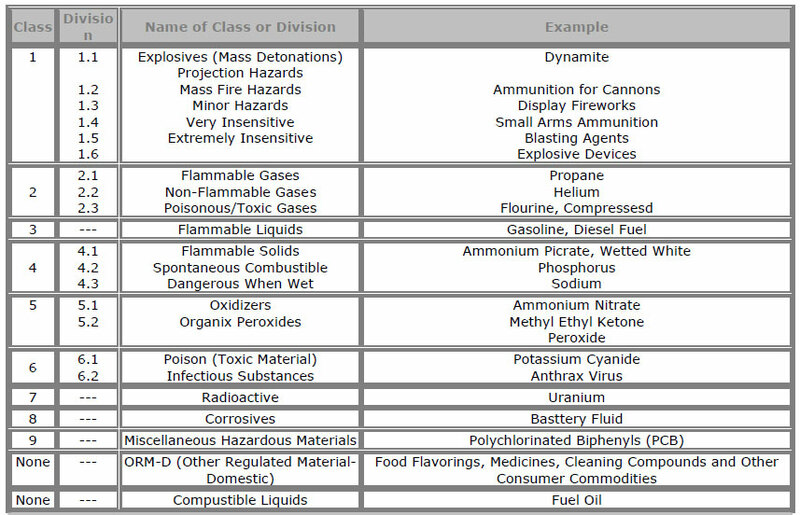 The table below lists 9 hazard classes. Drivers of placarded vehicles must have a commercial driver's license with the hazardous materials endorsement. Drivers must learn how to safely load and transport hazardous products. To get the endorsement, you must pass a written test on Section 9 of this manual. If you transport hazardous products in a cargo tank with a gross vehicle weight rating of 26,000 pounds or more, you will also need a tank endorsement. Never drive a vehicle that needs placards unless you have a hazardous materials endorsement. Transporting hazardous materials without the proper placards is a crime. You will be stopped and cited and you will not be allowed to drive your truck further. It will cost you time and money. Driving without the proper placards could also risk your life and the lives of others. If you have a crash, emergency workers will not know about your hazardous cargo. Hazardous materials drivers must also know which products they can load together. Section 9 of this manual covers these regulations. Before loading a truck with more than one type of product, you must know if it is safe. If you do not know, ask your employer. Many hazardous products can injure or kill on contact. Federal regulations tell shippers how to package safely. This protects drivers and others from contact with the hazardous materials. 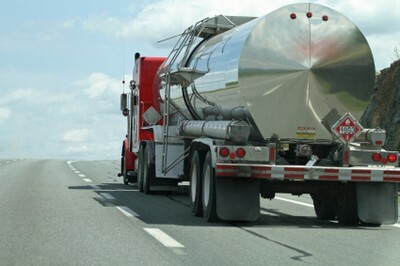 Other regulations tell drivers how to load, transport and unload bulk tanks. These are called containment rules. The shipper uses a shipping paper and package labels and markings to warn dock workers and drivers of the presence of hazardous materials, the hazard class and the specific hazardous material. The shipping paper describes the hazardous material being transported. Shipping orders, bills of lading and manifests are examples of shipping papers. others of the hazard. If the diamond label won't fit on the container, shippers put the label on a tag. For example, compressed gas cylinders that will not hold a label will have tags or decals. After an accident or hazardous material spill or leak, you may be injured and unable to tell others about your hazardous cargo. Fire fighters and police can prevent or reduce the amount of damage and injury if they know what hazardous materials you are carrying. Your life and the lives of others could depend on quickly locating hazardous materials shipping papers. For this reason, you must tab shipping papers related to hazardous materials or keep them on top of other shipping papers. • On the driver's seat when you are out of the vehicle. Placards are 10 ¾ inches on each side and are diamond-shaped. Cargo tanks and other bulk packaging display the I.D. number of their contents on placards or orange panels. A placarded vehicle must have at least 4 identical placards. They are placed on the front, rear and both sides of the vehicle. Not all vehicles that carry hazardous materials need placards. The regulations about placards are given in Section 9 of this driver's manual. You can drive a vehicle carrying hazardous materials if it does not require placards. If it requires placards, you may not drive it unless you have a hazardous material endorsement on your commercial driver's license. Driving a commercial vehicle requires skill, education and physical fitness. Driving for long hours is tiring and even the best drivers will become less alert. You can cope with fatigue and maximize your alertness by following the federal regulations on hours of service and off duty time. You can also combat fatigue and maximize your alertness by maintaining a healthy lifestyle. In an effort to control driver fatigue, the federal government established regulations governing hours of service and required off- duty time. These regulations specify driving time, • ff-duty time and prohibit driving after you have been • n-duty in excess of specified amounts of time. Although these regulations once applied only to drivers who crossed state lines, in most states they now apply to all drivers, even those who operate solely within a single state. • On-duty time refers to all the time, including driving time, that you perform work for a motor carrier. It also includes the time that you are required to stay with your assigned vehicle. And, it includes time that you perform paid work of any other kind--for example, a second job. • Driving time refers to the total amount of time you spend at the controls of a commercial vehicle in operation. • 7/8 consecutive days refers to the period of time beginning at the day and time designated by the motor carrier as a period of 24 consecutive hours. • You may not drive more than 10 hours following your last period of 8 consecutive hours off duty. • You may not drive after being on duty (driving plus all other work) for 15 hours following your last 8 consecutive hours off- duty. duty 70 hours in a period of 8 consecutive days. Before driving again, you must have sufficient time off to be in compliance with the hours of service limits. • Get enough rest. When you go off duty, your first concern should be to get enough rest so that you will have the 7 to 8 hours sleep that every person needs. After you have gotten your sleep and you have been awake and alert for more than 8 hours without being notified of your next assignment, take a short nap so you will be alert when you return to work. Remember, sleep is the only way to overcome fatigue. • Schedule your trips safely. Ideally, you should try to schedule trips for the hours when you are normally awake. However, many motor carriers operate around the clock. Therefore, you must be prepared to drive safely during irregular work times. • Rest during your • ff-duty times. Everyone is affected by the circadian rhythm. This is the name of the 24-hour cycle of alertness that affect everyone. Normally, most people have low points of alertness from 2 to 6 a.m. and from 2 to 5 p.m. If you are already tired, your risk of falling asleep during these periods is greatly increased. That's why it's so important to get as much rest as possible during your • ff-duty hours. Remember, many heavy vehicle crashes occur between midnight and 6 a.m.
• Take a nap. If you get sleepy, a short nap will do more for you than a cup of coffee. Find a safe place to pull over and stop. Remember, parking on the shoulder of an interstate or other main highway is dangerous and is not permitted except in an emergency. Napping is not considered an emergency. Find a rest area, truck stop or a safe place along a nearby road. • Avoid drugs. No drugs can help you overcome being tired. Stimulants may keep you awake for a while; but, they won't make you alert. When they wear off, you'll be even more tired than if you had never taken them. Sleep is the only thing that will overcome fatigue. sleepy. If you must drive with a cold, you are better off suffering from the cold than from the effects of the medicine. • Keep cool. A hot, poorly ventilated cab can make you sleepy. Keep the window or vent cracked, or use the air conditioner. • Take a break. Stay alert by stopping for a short break every 2 to 3 hours. Walk around and give your vehicle a safety check. Every year, 19,000 people are killed because of drivers who have been drinking. About One-half of all fatal crashes involve drinking drivers. Be sure that you know the facts. A few drinks will improve your driving. Alcohol is a drug that will make you less alert and reduce your ability to drive safely. Some people can drink a lot and not feel the effects. Everyone who drinks alcohol is affected. Just one drink affects your ability to drive safely. If you eat a lot, you won't get as drunk. Food will not keep you from getting drunk. Coffee and fresh air will help you get sober. Only time will help you get sober. Other methods don't work. Stick with beer. It's not as strong as wine or whiskey. A 12 -ounce glass of beer, a five-ounce glass of wine and a shot of liquor have the same amount of alcohol. Just one alcoholic drink can affect your driving ability. Even a small amount of alcohol affects the brain. Alcohol first affects the part of the brain that controls judgment and self-control. This can keep you from knowing when you are getting drunk. Alcohol affects your judgment and driving ability. Your chances of being in a crash are seven times greater if you drive after drinking than if you drive sober. Alcohol also affects coordination, reaction time and vision. Ninety percent of the information used in driving comes from seeing. Alcohol relaxes the eye muscles. As a result, you cannot focus properly. Any restriction in vision could cause you to crash. Blood alcohol content (BAC) is the amount of alcohol in your body. BAC depends on the amount of alcohol consumed, the time spent drinking and your body weight. The more you drink, the higher your BAC will be and the more affected your driving will become. It takes about one hour for the blood stream to rid itself of one once of alcohol. For example, if you drink three beers, it will take approximately three hours for your body to rid itself of the alcohol. Only time can get rid of the effects of alcohol. Coffee, cold showers or exercise will not make you sober. Mixing alcohol with other drugs usually multiplies the effects of both. Having one drink and taking an aspirin or simple cold pill could have the same effect as several drinks. Almost any drug can reduce your ability to drive safely. It's not just illegal drugs that cause problems. Many Over-the-counter drugs and prescription drugs can cause sleepiness and dizziness. These drugs often affect your alertness and reaction time. Read the label before taking any drug or medicine. Look for warnings about the side effects. If you are uncertain about the effects of a drug, ask your doctor or pharmacist. Laws prohibit possession and use of many drugs while you are on duty. It's illegal to be under the influence of any controlled substance, narcotic or other substance that can make a driver unsafe. This includes prescription and • ver-the-counter drugs that may make you sleepy or affect your driving ability. Possession and use of a drug is legal if your doctor tells you that the drug will not affect your driving ability. Alcohol and drug testing. Federal regulations require that drivers be tested for misuse of alcohol and the use of controlled substances such as amphetamines, marijuana, opiates, PCP and cocaine. • when returning to duty. Promptly following your employer's instructions for alcohol and drug testing. Violation of the regulations for alcohol and drug use and testing can jeopardize your career as a commercial driver.